Up until a few years ago, the number of books on the history of gaming was relatively small, and the ones which did exist generally focused on the US market. More recently, however, there has been an explosion of new media, largely fuelled by the Kickstarter revolution. Memories of a Retro Gamer is one such addition. Most of these books are generally very good at covering the facts and figures, they often fail to capture just what it was about those early years that made them feel so special to the people who actually *played* the games rather than creating them. Andrew Foster is a musician by day but has long been involved in the retro scene via the RGDS podcast and his work for Games You Loved. 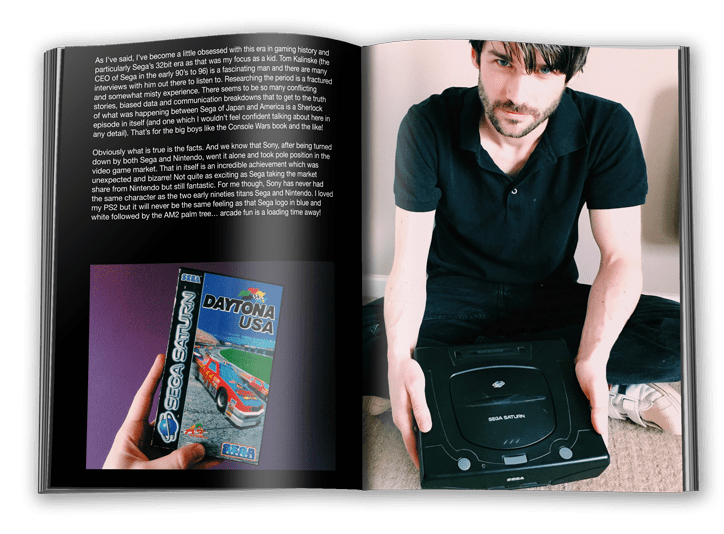 In ‘Memories of a Retro Gamer’ he attempts something a little different from the usual historical approach, choosing instead to build a book around his memories of his own gaming ‘golden age’ from the late ’80s and into the mid-’90s. By Andrew’s own admission, ‘Memories’ is a lighter, less technical book, written in a personable, conversational style in order to be as easy to read as possible. The content is presented as a series of essays on subjects dear to the author’s heart, interspersed with large, full-colour photographs many of which feature Andrew himself alongside cherished items from his collection. 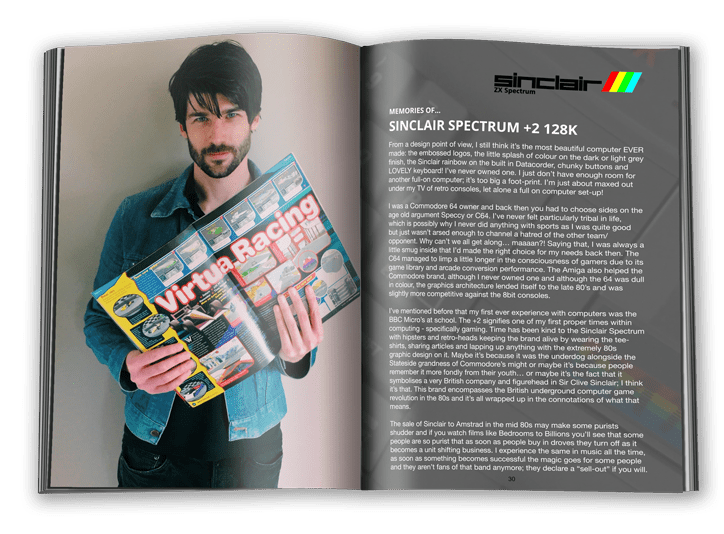 Starting with his first introduction to the world of computing via his friend’s Spectrum +2 and moving on through the 90s via the Commodore 64, Mega Drive, Gameboy and Saturn, each article is fairly short and self-contained which makes the book easy to pick up whenever you have a few minutes spare. Other chapters cover favourite games, tunes and magazines so although the time period covered is relatively short, there is a decent amount of variety in the subjects covered. The articles themselves move quickly from memory to memory without dwelling too much on the details or getting bogged down in a single game or machine, and although this keeps the pace up the lack of detail can sometimes feel a little frustrating and some paragraphs are little more than straight lists of games with no exposition whatsoever. That said, Andrew’s genuine enthusiasm for his chosen subjects is apparent throughout and you quickly grow to understand his favourites and why they mean so much to him; his words come from the heart rather than Wikipedia and you get the impression that this is less of a history lesson and more of an attempt to convey how these games made him feel and how the choices he made back then have helped to shape his life today. Unfortunately, while Andrew’s style is straight-forward and easy to read, the book is slightly let down by some rather poor editing; many of the articles are littered with spelling and grammatical errors and this often ruins the flow of the text. In a Web-based article, this would be easier to forgive (and correct), but it’s disappointing that a book could make it to print with so many mistakes and the mistakes can’t help but tarnish an otherwise well-presented product. Weighing in at a relatively lightweight 56 pages ‘Memories of a Retro Gamer’ isn’t a huge time investment and at only £3 the PDF version isn’t going to break the bank. If you’ve enjoyed Andrew’s articles for Games You Loved or your own retro timeline overlaps with his then there are plenty of memories here to bring a rose-tinted smile to your face. If you’re looking for greater detail or deeper analysis of the subjects at hand, however, then you might be better trying one of the other, more heavyweight retro history offerings. If you’ve enjoyed Andrew’s articles for Games You Loved or your own retro timeline overlaps with his then there are plenty of memories here to bring a rose-tinted smile to your face. If you’re looking for greater detail or deeper analysis of the subjects at hand, however, then you might be better trying one of the other, more heavyweight retro history offerings. ← A Gremlin in the Works Book Review.